Shanghai, China, January 5, 2017 /ChinaNewswire.com/ - There are more Chinese users on Facebook than there are citizens of over 170 countries around the world. There were 52.87 million Chinese users on Facebook in 2016, and the number is forecast to grow to 54.39 by the end of 2017, according to figures from Statista (Digital Market Outlook). With this growth comes opportunities, and Facebook has been reaping rewards in China since the middle of 2014 when it first announced the opening of an office to handle advertising from Chinese customers. As Facebook’s advertising clients increase, more Chinese businesses will want to know how to effectively utilize Facebook to reach customers outside the Middle Kingdom. 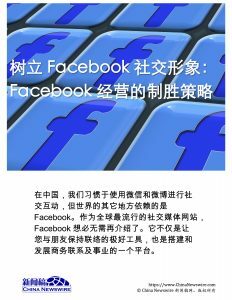 Press release distribution and media data company China Newswire has published its latest White Paper "Giving Face on Facebook – Managing a Winning Facebook Strategy" to help Chinese enterprises understand the high-level methods used to employ a profitable Facebook strategy. China already has its own social networks and social messaging platforms such as WeChat and Weibo, but Facebook gives Chinese businesses access to important markets outside the Middle Kingdom. Sourcing, manufacturing, and hospitality businesses inside China all rely on Western customers to build the Chinese economy. With a journalist database of over 30,000 records and a operational history for over 10 years, China Newswire is the leading press release distribution marketing platform in Greater China. Covering dozens of topics, including technology, finance, corporate social responsibility, transportation, travel, and education, China Newswire supports companies around the world to elevate their online visibility among Chinese media. With cutting-edge dashboard reports, superior client services, and fundamental ability to help companies expand their social media reach, China Newswire is the leader in content marketing. More information at https://www.chinanewswire.com.